Require a Custom Made Carport? Look no further! At Sheds and Shelters we have a large range of standard single and double entry flat and gable roof Formsteel carports but can also custom make! We have many years of experience supplying and installing Formsteel carports and are more than happy to custom design a carport to suit your situation. The width, depth and height of the carport can all be modified and post placement can be altered to a certain extent. We have also supplied tapered carports and cantilevered carports for better access and can also supply additional framing for tilt/roller doors or for cladding 1 or 2 sides – the options are endless with Formsteel Carports! Contact us via email with as much information as possible, drawings and photos are always great, or give us a call! 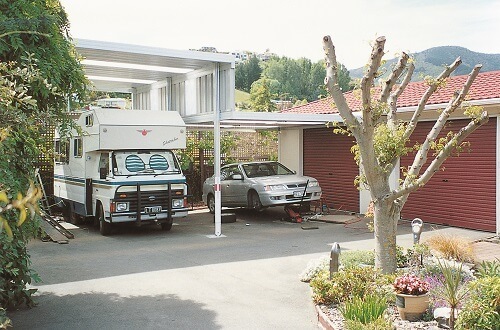 The Formsteel Carports are NZ made and are fully engineered to suit NZ conditions – snow and wind rated! The Formsteel Carport systems feature roll formed steel which allows for a strong shelter with clear span roofing and a clean uncluttered attractive appearance – no additional framing is necessary! The Formsteel Carports are very versatile and have a wide range of uses such as a simple carport, walkway cover, a farm shelter, pump shelter, Campervan and Boat shelters, Patio covers and pool and spa pool shelters!